I was given the opportunity to provide a guest review of a film by Martin Scorsese for Andy Swinnerton’s site, Rorschach Reviews, which got me so excited that I asked if I could review two films. 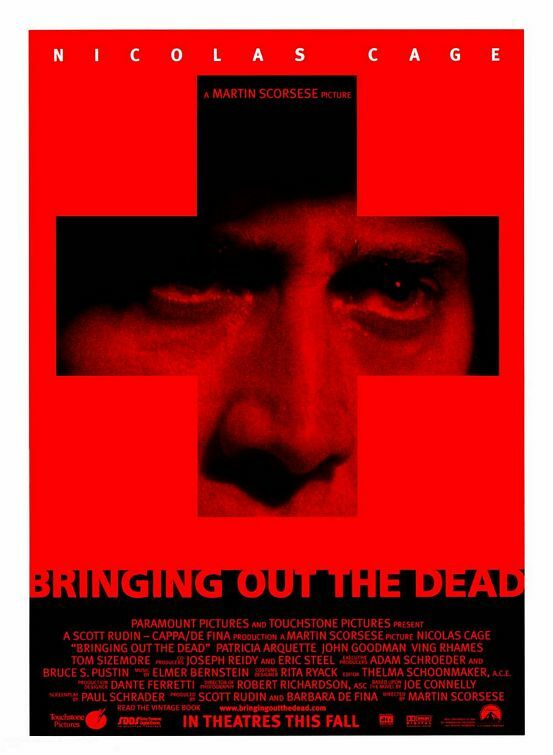 As a result, this is the first of two new reviews I have written in regards to Scorsese’s past work, covering his 1999 effort, Bringing Out the Dead, starring Nicolas Cage. Frank Pierce: Oh, I see. With all the poor people of this city who wanted only to live and were viciously murdered, you have the nerve to sit here, wanting to die, and not go through with it? You make me sick! For a director spotlight review on Martin Scorsese, my mind immediately leapt to his 1999 film, Bringing Out the Dead. It is not that I think it is one of Scorsese’s best, though I do really like it, but I find it to be a film that deserves to be talked about more. It has less of a standard plot and more of a mood it wants to convey by settling you in with Nicholas Cage’s burnt-out paramedic character. It also contains some very good performances, another great soundtrack from a director who loves music, and a more unrestrained look at Scorsese’s kinetic visual style. Similar to how Casino put Scorsese back into gangster-film mode, following The Age of Innocence, Bringing Out the Dead came after Kundun and put the director back into territory he explored with some of his earlier work – namely Taxi Driver, but with a darkly comic edge. The film takes place over the course of three nights in early 90s Manhattan (specifically Hell’s Kitchen). Frank Pierce (Cage) is a burnt-out paramedic, working the graveyard shift in a two-man ambulance team. He is continually exhausted and depressed, with the added notion of seeing ghosts walking the streets, particularly that of a young woman he failed to save six months prior. Over the three nights, Frank is assigned with a different partner during each of his shifts: Larry (John Goodman), Marcus (Ving Rhames), and Tom (Tom Sizemore). During the first shift we see, Frank befriends the daughter of a cardiac arrest patient he brought in, Mary (Patricia Arquette), an ex-junkie. Frank spends much of the film dealing with many people in the neighborhood in need of help, mainly due to the effects of a new form of heroin that is hitting the streets. He also attempts to find some form of clarity amidst the stress caused to him by his own psychological demons, which is aided by the presence of Mary. Bringing Out the Dead was scripted by one of Scorsese’s best collaborators, Paul Schrader (Taxi Driver, Raging Bull), who based the script off of a novel of the same name by Joe Connelly. The book was a bestseller and the film was met with positive reviews, though it still flopped at the box office. Despite the Scorsese brand (which is only occasionally successful) and the drawing power of Nic Cage (who is a wild card at the box office), Bringing Out the Dead faded into obscurity pretty quickly, but it is a film that has not gotten past me. I do not want to spend a whole lot of time comparing this film to Taxi Driver, as the similarities are easy enough to spot, but not something I want to focus on, and because Taxi Driver is practically in a different league in terms of that film’s legacy. With that said, both films do have a central performance from a character that is essentially lost in his life. While Travis Bickle is suffering from PTSD, among other problems, Frank is dealing with being burnt out by the job. He has seen a lot of death and does not sleep well because of it. At the same time, while we are not seeing a truly harsh side of New York, like certain areas that Taxi Driver explores, Bringing Out the Dead is not without its rougher parts. Given that Frank and his various partners are dealing with an assortment of different people suffering from drug-related problems, among other things, it would be hard not to recognize the grittiness of the Hell’s Kitchen depicted. 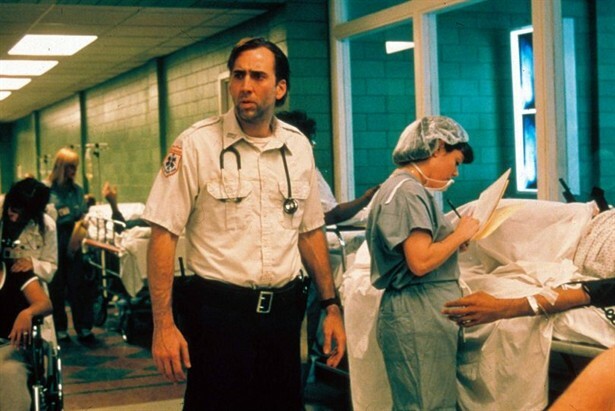 Cage really is pretty great in this movie though, providing what is arguably one of his best performances. Nicolas Cage has certainly become synonymous for many with the punch line of movie star jokes, but I continue to find him fascinating to watch on screen, as he is always giving it his all. Of course, it really all comes down to the screenplay and character that has been written, and Frank is the type of character that plays to Cage’s strengths, as the man is unhinged, but not completely overboard in this film. We see him suffering physically, as his eyes clearly indicate that he is ready to get into a bed and sleep for years, yet he cannot seem to allow himself to do that and is distressed by what he has seen in his work. At the same time, Frank is great at his job. When he is at work, he knows what to do and how to handle the situation; it is just unfortunate that he has to deal with so many lost causes. He is less aware of how to communicate with certain people, such as Mary, but he is also appropriately matched by the various other paramedics he is partnered up with. In these roles, Goodman, Rhames, and Sizemore all bring a great level of energy to their parts that are different for each character. Goodman is doing his job and eats to help himself be content with his responsibility. Rhames takes on the guise of an evangelical preacher during his shift. Sizemore uses his own rage against junkies. These are solid character roles for each actor to work with and it does not stop there. Patricia Arquette’s character may have only one emotional place to be coming from, as she deals with the concept of a father she has had a tough time loving possibly approaching his death, as he is continually defibrillated and brought back to life in the ER, but she is good in the role. Her vulnerability is paired well with Cage, who interacts with her in ways that are smart enough not to resort to simply having them become romantically entangled. Also worth noting is the performance by Cliff Curtis as a drug dealer who operates a drug den and refers to it as an oasis, which seems like a place for Mary to find solace, even though Frank knows better, but must tread lightly. It is a credit to the film that you can accept this drug dealer character and even find him likable, despite knowing that he is up to no good, given his profession. It would be interesting to read more about how people reacted to Scorsese’s direction in this film. From a technical standpoint, I think Bringing Out the Dead is a fantastic version of Scorsese going into overdrive to really convey the world that Frank is living in. Watching a film that takes place predominantly at night and mostly from in or around an ambulance gave way to seeing this vehicle careen down streets and serve as the chariot in which Frank languishes in, as we come to learn more about him and what has him so burnt out inside. The leading cause of his unsettled nature becomes a recurring visual motif of a dead girl, which is played up quite well through the use of some clever visual effects. The film’s visual aesthetic is wonderfully suited to this film, as is the eclectic soundtrack which is filled with songs from many classic rock groups including The Who, The Clash, and Van Morrison, but makes way for other music choices that may seem odd, but end up working very nicely into a film that features characters already pushed to their limits. Regarding what holds this film back, Bringing Out the Dead has no real specific problem, were one to be accepting of how the film is presented in general. If one is not on board with Cage or the film to begin with, then I can see a lack of really appreciating it. If I had to narrow down some issues, it would be how the film’s energy seems to dip in its final twenty minutes. There is a certain event that brings Frank to the top of a building where he has a conversation with a character who is in a convincing amount of pain. That point in the film tends to always have me thinking we have hit some sort of climax, when the film does in fact have more to work with afterward. As a result, I tend to find myself thinking we are wrapping up for quite some time, as the film eventually reaches its end. Given that the film is entertaining in spots, but also reliant on a certain type of subject matter, spending the amount of time that we do can be a little trying, if the film lessens on its own energy. In writing all of this I have attempted to understand more as to why this feels like such a standout film for me. I have only watched it in full a few times, but always find it very interesting and tend to question why it did not do better. Cage is great amongst many in a cast that all deliver strong performances. Scorsese is not restraining himself in anyway or falling victim to convention, as Schrader’s script is different from many plot-driven films. And for a film about paramedics becoming affected by the amount of life and death they must contend with on a nightly basis, Bringing Out the Dead is a very entertaining film, with lots of darkly comic bits scattered throughout. I guess that is where my fondness for the film lies. While it sits outside the realm of the more “important” films in Scorsese’s oeuvre, it is a film that appeals to my sensibilities and arrived at a time when I was really growing into my appreciation for film (it arrived in theaters a week after Fight Club, which does sit on the top for me). If Bringing Out the Dead is considered one of Scorsese’s “forgotten films”, then taking some time to check it out would not at all be the worst thing to do, as it has a lot of good to discover within it. Dr. Hazmat: I thought you said this guy was dead. Frank Pierce: He got better.